The short French text, ‘Fol est qui fol boute’ is one of the only French items in the Geraardsbergen Manuscript. Who lets his daughter marry a madman. 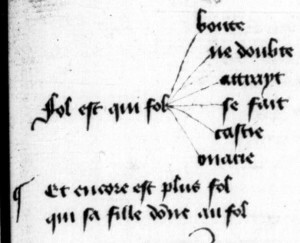 This text also appears in a number of French manuscripts, including BnF fr. 1555, where it is written out in full as part of a larger proverb collection. detail from BnF fr. 1555, 77v.